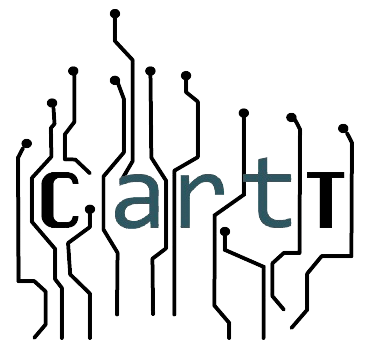 Carleton Arts & Technology (CArtT) is a curricular initiative at Carleton to foster integration of arts and technology on campus. The initiative encourages faculty from art and art history, cinema and media studies, dance, theater, and music to develop curricular initiatives that involve the use of technology, but we also invite faculty from other areas, such as computer science, who are interested in developing curricular interaction with the arts. CArtT was created through a grant from the Sherman Fairchild Foundation, a private non-profit philanthropic organization based in Chevy Chase, Maryland. A second phase of CArtT was funded beginning with the 2018-19 academic year. The grant will provide support (faculty stipends, materials, technology) for interdisciplinary faculty teams of two or more members to collaborate in developing new capacities in key technologies. This phase of the grant will focus primarily on cooperative, group development of ideas and projects in order that faculty can foster long-term collaborations. Partnerships are encouraged with other initiatives on campus. We hope to develop and implement at least two faculty or faculty-student technology-rich projects/installations each year, which may include collaboration with non-campus artists and arts organizations. Phase I did not explicitly emphasize faculty art-making. Phase II will provide opportunities for faculty to incorporate technology in their artmaking—with colleagues or with visiting artists—and exhibit the work during the academic year. The grant contemplates implementing new technology modules in at least ten courses. Faculty can propose revision of courses and incorporation of new technologies in their teaching. Five arts and technology research fellowships/internships will be funded each year. These internships may take several forms, including faculty assistance on-campus, or internships that involve arts and technology at arts organizations in other communities. Faculty wishing to propose summer arts practice assistance internships should submit a proposal by February 11. Other internships will be awarded on a rolling basis after decisions are made on the first round of proposals.